Having been fond of musicals during his time as a drummer, Chazelle first conceptualised the film alongside Justin Hurwitz while attending Harvard University together. Moving to Los Angeles in 2010, Chazelle wrote the screenplay but did not find a studio willing to finance the production without changes to his design. Following the success of his 2014 film Whiplash, the project was picked up by Summit Entertainment. Filming took place in Los Angeles from August to September 2015, with the film's score composed by Hurwitz and the dance choreography by Mandy Moore. La La Land premiered at the 73rd Venice International Film Festival on August 31, 2016, and was released in the United States on December 9, 2016. It grossed $446 million worldwide against a production budget of $30 million. 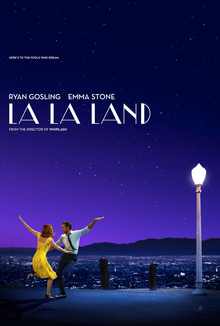 La La Land was critically praised, particularly for Chazelle's screenplay and direction, Gosling and Stone's performances, musical score, musical numbers, cinematography, and production design. Both the American Film Institute and National Board of Review selected La La Land as one of the top ten films of 2016. It won a record-breaking seven awards from its seven nominations at the 74th Golden Globes and received eleven nominations at the 70th British Academy Film Awards, winning five awards, including Best Film. It also received a record-tying fourteen nominations at the 89th Academy Awards, including Best Picture; winning in six categories including Best Director and Best Actress (for Stone). While stuck in Los Angeles traffic, aspiring actress Mia Dolan has a moment of road rage with Sebastian Wilder, a struggling jazz pianist. After a bad day at work, Mia's subsequent audition goes poorly when the casting director takes a call in the middle of an emotional scene. That night, Mia's roommates take her to a lavish party in the Hollywood Hills, promising her that someone in the crowd could jump-start her career; but she is forced to walk home in disappointment after her car is towed. During a gig at a restaurant, Sebastian slips into a jazz improvisation despite warnings from the owner to only play songs from a traditional Christmas setlist. Mia overhears him playing as she passes by. Moved, she enters the restaurant to witness Sebastian being fired for his disobedience. As he storms out, Mia attempts to compliment him, but he brushes her off. Months later, Mia runs into Sebastian at a party where he plays in a 1980s pop cover band. After the gig, the two walk to their cars and lament wasting a lovely night together despite the clear chemistry between them. Sebastian arrives at Mia's work, and she shows him around the Warner Bros. backlot, where she works as a barista, while explaining her passion for acting. Sebastian takes Mia to a jazz club, describing his passion for jazz and his desire to open his own club. Sebastian invites Mia to a screening of Rebel Without a Cause; Mia accepts, forgetting a commitment with her boyfriend Greg. Bored with the latter date, she goes to the theater and finds Sebastian as the film begins. The two conclude their evening with a visit to the Griffith Observatory. After more failed auditions, Mia decides, at Sebastian's suggestion, to write a one-woman play. Sebastian begins to perform regularly at a jazz club, and the two move in together. Sebastian's former classmate Keith invites him to be the keyboardist in his jazz fusion band, where he will enjoy a steady income. Although he is dismayed by the band's pop style, Sebastian signs after overhearing Mia trying to convince her mother that Sebastian is working on his career. The band finds success, but Mia attends one of their concerts and realizes that this is not the type of music Sebastian wants to perform. During the band's first tour, Mia and Sebastian get into an argument; she accuses him of abandoning his dreams, while Sebastian claims she liked him more when he was unsuccessful. Sebastian misses Mia's play due to a band photo shoot that he had forgotten about. The play is a disaster; few people attend, and Mia overhears dismissive comments. Mia is unwilling to forgive Sebastian for missing the play and ends their relationship. Despondent and unable to pay the theater back, Mia moves back home to Boulder City, Nevada. Sebastian receives a call from a prominent casting director who attended Mia's play and wants to invite her to a film audition. Sebastian drives to Boulder City and persuades Mia to attend. During the audition, Mia is asked simply to tell a story; in response, she sings "Audition (The Fools Who Dream)", a story about her aunt's lost loves. Sebastian, confident the audition was a success, encourages Mia to devote herself to film acting. The two profess they will always love each other but are uncertain of their future. Five years later, Mia is a famous actress and is married to another man, David, with whom she has a daughter. One night, the couple stumble upon a jazz bar. Noticing the "Seb's" logo she had once designed, Mia realizes Sebastian has opened his club. When Sebastian notices Mia in the crowd, he plays their love theme on the piano, and a dream sequence unfolds in which the two imagine what might have been had both their relationship and their careers thrived. Mia shares a poignant smile with Sebastian, then leaves with her husband. As a drummer, Damien Chazelle has a predilection for musical films. He wrote the screenplay for La La Land in 2010, when the film industry seemed out of reach for him. His idea was "to take the old musical but ground it in real life where things don't always exactly work out," and to salute creative people who move to Los Angeles to chase their dreams. He conceived the film when he was a student at Harvard University with his classmate Justin Hurwitz. The two explored the concept in their senior thesis through a low-budget musical about a Boston jazz musician, Guy and Madeline on a Park Bench. Chazelle was moved by the tradition of 1920s city symphony films, such as Manhattan (1921) and Man with a Movie Camera (1929), that paid tribute to cities. After graduating, both moved to Los Angeles in 2010 and continued writing the script, but made a few modifications, such as altering the location to Los Angeles instead of Boston. "They're both about the struggle of being an artist and reconciling your dreams with the need to be human. La La Land is just much less angry about it." He said that both films reflect his own experiences as a filmmaker working his way up the Hollywood ladder. La La Land in particular is inspired by his experience of moving from the East Coast with preconceived notions of what L.A. would be like, "that it was all just strip malls and freeways." Chazelle was unable to produce the film for years as no studio was willing to finance an original contemporary musical, with no familiar songs. It was also a jazz musical, which The Hollywood Reporter called an "extinct genre". He believed that since he and Hurwitz were unknown at that time, it might have made financiers dubious about the project's potential. Chazelle found producers through friends who introduced him to Fred Berger and Jordan Horowitz. With the two producers on board, the script went to Focus Features at a budget of around $1 million. The studio demanded alterations: the male lead was asked to be changed from a jazz pianist to a rock musician, the complicated opening number had to be altered, and the story's bittersweet ending needed to be dropped. Chazelle scrapped the project and moved on. Chazelle later wrote Whiplash, which was an easier concept to sell and a less risky investment. After Whiplash was well received by critics upon its premiere at the 2014 Sundance Film Festival in January, Chazelle continued his efforts to bring La La Land to the big screen. A year later, when Whiplash earned five Oscar nominations at the 87th Academy Awards, including Best Picture, and grossed nearly $50 million worldwide off a $3.3 million production budget, Chazelle and his project began to attract attention from studios. Five years after Chazelle wrote the script, Summit Entertainment and Black Label Media, along with producer Marc Platt, agreed to invest in La La Land and distribute it. They had been impressed by the critical and commercial success of Whiplash. Lionsgate's Patrick Wachsberger, who previously had worked on the Step Up franchise, pushed Chazelle to increase the film's budget since he felt high-quality musicals could not be made cheaply. Initially, Miles Teller and Emma Watson were slated to star in the leads. Watson dropped out because of a commitment to the 2017 musical adaptation of Beauty and the Beast, while Teller departed via long contract negotiations. Conversely, Gosling turned down a role as the Beast in Beauty and the Beast in favor of La La Land. Chazelle decided to make his characters somewhat older, with experience in struggling to make their dreams, rather than younger newcomers just arriving in Los Angeles. Emma Stone plays Mia, a struggling actress in Los Angeles. Stone has loved musicals since she saw Les Misérables when she was eight years old, saying that "bursting into song has always been a real dream of mine", and that her favorite film is the 1931 Charlie Chaplin romantic comedy City Lights. She studied pom dancing as a child, with a year of ballet. She moved to Hollywood with her mother at the age of 15 to pursue a career, and struggled constantly to get an audition during her first year. When she did, she often was turned away after singing or saying just one line. Stone drew from her own experiences for her character of Mia, and some were added into the film. She met Chazelle in 2014 while she was making her Broadway debut in Cabaret. Chazelle and Hurwitz saw her perform on a night when the actress had a cold. She met with Chazelle at Brooklyn Diner in New York City, where the director outlined his vision for the planned film. Stone gained confidence from performing in Cabaret to handle the demands of the film. In preparation for her role, Stone watched some of the musical movies that inspired Chazelle, including The Umbrellas of Cherbourg and Fred Astaire and Ginger Rogers collaborations. Stone accepted the offer because Chazelle was so passionate about the project. Ryan Gosling plays Sebastian, a jazz pianist. Like Stone, Gosling drew from his own experiences as an aspiring artist. One incident was used for Mia. Gosling was performing a crying scene in an audition and the casting director took a phone call during it, talking about her lunch plans while he was emoting. Chazelle met with Gosling at a bar near the latter's home in Hollywood Hills, when Gosling was about to begin filming for The Big Short. Chazelle cast the two immediately after Summit bought the film. He said the two "feel like the closest thing that we have right now to an old Hollywood couple" as akin to Spencer Tracy and Katharine Hepburn, Fred Astaire and Ginger Rogers, Humphrey Bogart and Lauren Bacall, and Myrna Loy and William Powell. The film marked the third collaboration between Gosling and Stone, following Crazy, Stupid, Love (2011) and Gangster Squad (2013). Chazelle asked the two about their audition disasters when they were both trying to make it. Both learned how to sing and dance for the film's six original tunes. The rest of the cast – J. K. Simmons, Sonoya Mizuno, Jessica Rothe, Callie Hernandez, Finn Wittrock, Rosemarie DeWitt, John Legend, Jason Fuchs, Meagen Fay – were announced between July and August 2015. Legend plays Keith, a long-time friend of Sebastian. The film was choreographed by Mandy Moore. Rehearsals took place at a production office in Atwater Village, Los Angeles over the span of three to four months, beginning in May 2015. Gosling practiced piano in one room, Stone worked with Moore in another, and costume designer Mary Zophres had her own corner of the complex. Gosling, with no previous experience, had to learn how to play the piano, as no hand models were used. Moore emphasised working on emotion rather than technique, which Stone said was key when they filmed the Prius car scene. To help his cast and crew get their creative mode flowing, Chazelle held screenings on the soundstages every Friday night of classical films that had inspired him for the film, including The Umbrellas of Cherbourg, Singin' in the Rain, Top Hat, and Boogie Nights. From the beginning, Chazelle wanted the film's musical numbers to be filmed "head to toe" and performed in a single take, like those of the 1930s works of Fred Astaire and Ginger Rogers. He also wanted the film to emulate the widescreen, CinemaScope look of 1950s musicals such as It's Always Fair Weather. Consequently, the movie was shot on celluloid film (not digitally) with Panavision equipment in CinemaScope's 2.55:1 aspect ratio, but not in true CinemaScope as that technology is no longer available. Chazelle wanted Los Angeles to be the primary setting for his film, commenting that "there is something very poetic about the city I think, about a city that is built by people with these unrealistic dreams and people who kind of just put it all on the line for that." Principal photography on the film officially began in the city on August 10, 2015, and filming took place in more than 60 locations both in and near Los Angeles, including the Angels Flight trolley in downtown, houses in the Hollywood Hills, the Colorado Street Bridge, the Rialto Theatre in South Pasadena, the Warner Bros. studio lot, the Grand Central Market, Hermosa Beach's Lighthouse Café, Chateau Marmont Hotel, and the Watts Towers, with many scenes shot in one take. It took 40 days to complete shooting, finishing in mid-September 2015. The opening pre-credits sequence was the first to be shot, and was filmed on a closed-off portion of two carpool direct connector ramps of the Judge Harry Pregerson Interchange, connecting the I-105 Carpool Lane to the I-110 Express Lanes, leading to Downtown Los Angeles. It was filmed in a span of two days, and required over 100 dancers. For this particular scene, Chazelle wanted to give a sense of how vast the city is. The scene was originally planned for a stretch of ground-level highway, until Chazelle decided to shoot it in the 105–110 interchange, which arcs 100 feet (30 m) in the air. Production designer David Wasco said, "I thought somebody was going to fall off and get killed." Not every portion of the highway was blocked. Chazelle compared the scene to the yellow brick road leading to the Emerald City in The Wizard of Oz (1939). Chazelle scouted for "old L.A." locations that were in ruins, or were perhaps razed. 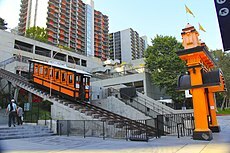 One such example was the use of the Angels Flight trolley, built in 1901. The funicular had been closed in 2013 after a derailment. Attempts were made to repair and re-open the railway, but to no avail. However, the production team was able to secure permission to use it for a day. Chazelle and his crew then arranged to have it run for shooting (it was re-opened to the public in 2017). Mia works at a coffee shop on the Warner Bros. studio lot; Chazelle considered studio lots to be "monuments" of Hollywood. Production designer Wasco created numerous fake old film posters. Chazelle occasionally created names for them, deciding to use the title of his first feature, Guy and Madeline on a Park Bench (2009) for one poster, which reimagines it as a 1930s musical. The six-minute-long Prius car scene had to be completed during the brief "magic hour" moment at sunset. It took eight takes and two days to shoot it. When Ryan Gosling and Emma Stone finally nailed it, "everybody just exploded," Stone said. Since Gosling and Stone were not primarily dancers, the two made a number of mistakes, especially during long uninterrupted single-take musical numbers. However, Chazelle was very sympathetic towards them, understanding their lack of experience and not minding their errors. While shooting Sebastian and Mia's first dance together, Stone stumbled over the back of a bench, but picked right up and kept on going with the scene. The argument during the romantic dinner that Sebastian prepared for Mia was one of the scenes that was re-written more than any other. Gosling and Stone also helped create the dialogue of the scene to get it to be one of the more realistic scenes in a film filled with fantasy and fantastical elements. Chazelle spent nearly a year editing the film with editor Tom Cross, as the two were primarily concerned with getting the tone right. The songs and score for La La Land were composed and orchestrated by Justin Hurwitz, Chazelle's Harvard University classmate, who also worked on his two prior films. The lyrics were written by Pasek and Paul, except for "Start a Fire", which was written by John Legend, Hurwitz, Marius de Vries and Angelique Cinelu. A soundtrack album was released on December 9, 2016, by Interscope Records, featuring selections from Hurwitz's score and songs performed by the cast. La La Land had its world premiere as the Venice Film Festival's opening night film on August 31, 2016. The film also screened at the Telluride Film Festival, the Toronto International Film Festival, beginning September 12, 2016, the BFI London Film Festival, the Middleburg Film Festival in late October 2016, the Virginia Film Festival, held at the University of Virginia on November 6, 2016, and the AFI Fest on November 15, 2016. The film was originally set for a July 15, 2016, release; however, in March 2016, it was announced the film would be given a limited release starting December 2, 2016, before expanding on December 16, 2016. Chazelle stated that the change was because he felt that the release date was not right for the context of the film, and because he wanted to have a slow rollout beginning with the early fall film festivals. The film was later pushed back a week to December 9, 2016, with the wide release still being planned for December 16, 2016. Lionsgate opened the film in five locations on December 9, 2016, and expanded it to about 200 theaters on December 16, 2016, before going nationwide on December 25, 2016. The film went fully wide on January 6, 2017, with a release into select IMAX theaters a week later. La La Land was released in the United Kingdom on January 12, 2017. The film was released in the Netherlands on December 22, 2016, and in Australia on December 26, with the rest of the territories planned for a release from mid-January 2017. Lionsgate released La La Land on Digital HD on April 11, 2017, and Blu-ray, Ultra HD Blu-ray and DVD on April 25, 2017. La La Land grossed $151.1 million in the United States and Canada and $295 million in other territories for a worldwide total of $446.1 million, against a production budget of $30 million. Deadline Hollywood calculated the net profit of the film to be $68.25 million, when factoring together all expenses and revenues for the film, making it one of the top 20 most profitable releases of 2016. La La Land began its theatrical release with a limited release in five theaters in Los Angeles and New York City on December 9. It made $881,107 in its opening weekend, giving the film a per-theater average of $176,221, the best average of the year. In its second week of limited release, the film expanded to 200 theaters and grossed $4.1 million, finishing 7th at the box office. It was an increase of 366% from the previous week and good for a per-theater of $20,510. The following week, the film had its wide expansion to 734 theaters, grossing $5.8 million for the weekend (including $4 million on Christmas Day and $9.2 million over the four days), and finishing 8th at the box office. On January 6, 2017, the weekend of the Golden Globes, the film expanded to 1,515 theaters and grossed $10 million over the weekend, finishing 5th at the box office. In its sixth week of release, the film grossed $14.5 million (a total of $16.9 million over the four-day weekend for Martin Luther King Jr. Day), finishing 2nd at the box office behind Hidden Figures. After receiving its 14 Oscar nominations, the film expanded to 3,136 theaters on January 27, 2017 (an increase of 1,271 from the week before) and grossed $12.1 million (up 43% from its previous week's $8.4 million). During the weekend of February 24–26 (the weekend of the Academy Awards) the film grossed $4.6 million, exactly the same amount it grossed the previous weekend. The next week, following its six Oscar wins, the film grossed $3 million. Critics praised the film's screenplay, direction, acting, score, and the chemistry of Gosling and Stone. The review aggregator Rotten Tomatoes gives the film an approval rating of 91% based on 421 reviews, with an average rating of 8.63/10. The website's critical consensus reads, "La La Land breathes new life into a bygone genre with thrillingly assured direction, powerful performances, and an irresistible excess of heart." On Metacritic, which assigns a normalized rating based on reviews, the film has a weighted average score of 93 out of 100, based on 53 critics, indicating "universal acclaim". It was the third- and sixth-highest scoring film released in 2016 on each respective site. Audiences polled by CinemaScore gave the film an average grade of "A–" on an A+ to F scale, while PostTrak reported audiences gave an 81% overall positive score and a 93% "definite recommend". Peter Travers of Rolling Stone gave La La Land four stars out of four, describing it as "a hot miracle" and complimenting its musical numbers, particularly the opening scene. He went on to name it his favorite movie of the year. Michael Phillips of the Chicago Tribune similarly lauded the opening sequence, in addition to highlighting Stone's performance, stating "she's reason enough to see La La Land." Despite being less enthusiastic about Gosling's dancing and the film's middle section, Phillips nevertheless gave the film four out of four stars, declaring it "the year's most seriously pleasurable entertainment". A.O. Scott of The New York Times praised the film, stating that it "succeeds both as a fizzy fantasy and a hard-headed fable, a romantic comedy and a showbiz melodrama, a work of sublime artifice and touching authenticity". Peter Bradshaw of The Guardian awarded the film five out of five stars, describing it as "a sun-drenched musical masterpiece." Tom Charity of Sight & Sound stated, "Chazelle has crafted that rare thing, a genuinely romantic comedy, and as well, a rhapsody in blue, red, yellow and green." Writing for The Boston Globe in December 2016, Ty Burr summarized the effectiveness of the film to relate to audiences stating: "...the movie traffics in the bittersweet happiness of treasuring things that are vanishing, like the unrealized future imagined in the climatic dance number, or those inky, star-filled dance floors that go on forever in old movies, or Hollywood musicals themselves. Or jazz: Sebastian has an early moment at a nightclub where he passionately sticks up for the music he loves. 'It's dying on the vine,' he says. 'And the world says 'Let it die. It had its time.' Well, not on my watch.' In that scene, he speaks for the director. By the end of 'La La Land,' he's speaking for all of us." The film was criticized by some for its treatment of race and jazz. Kelly Lawler of USA Today noted that Gosling's character has been referred to as a "white savior" by some critics, due to "his quest (and eventual success) to save the traditionally black musical genre from extinction, seemingly the only person who can accomplish such a goal." The sentiment was also expressed by Ruby Lott-Lavigna of Wired, Anna Silman of New York, and Ira Madison III of MTV News. 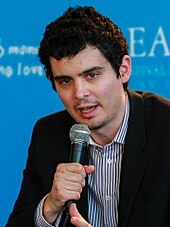 Rex Reed of the New York Observer also took aim at the film's intention to emulate the MGM musical classics, writing that "the old-fashioned screenplay, by the ambitious writer-director Damien Chazelle, reeks of mothballs", and that "the movie sags badly in the middle, like a worn-out mattress that needs new springs". The South China Morning Post remarked that aside from its racial treatment of jazz, much of the public criticism was towards the film being “a little dull”, the two leads' singing and dancing being considered unexceptional, and the lack of nuance in Stone's character, with Gosling's occasionally seen as insufferable. La La Land received eleven nominations at the 70th British Academy Film Awards, more than any other film of 2016. The film won in the categories of Best Film, Best Director, Best Actress in a Leading Role (for Stone), Best Cinematography, and Best Film Music. At the 74th Golden Globe Awards, La La Land received a leading seven nominations. The film won in all seven categories for which it was nominated, setting a record for the most Golden Globes won by a single film, namely Best Motion Picture – Musical or Comedy, Best Director, Best Actor – Comedy or Musical (for Gosling), Best Actress – Comedy or Musical (for Stone), Best Screenplay, Best Original Score, and Best Original Song ("City of Stars"). At the 89th Academy Awards, La La Land received a leading six awards, including Best Director, Best Actress (for Stone), Best Cinematography, Best Original Score, Best Original Song ("City of Stars"), and Best Production Design. The film received a total of 14 nominations, tying the record for most nominations by a single film with All About Eve (1950) and Titanic (1997). Its other nominations were Best Picture, Best Actor (for Gosling), Best Original Screenplay, Best Film Editing, Best Costume Design, a second nomination for Best Original Song ("Audition (The Fools Who Dream)"), Best Sound Editing, and Best Sound Mixing. During the Oscars ceremony, presenter Faye Dunaway incorrectly announced that La La Land had won Best Picture, reading from the card Warren Beatty opened, which was actually a duplicate of the Best Actress card for Emma Stone. After the cast and crew of La La Land took the stage, it took the show's producers more than two minutes and nearly three speeches to fix the mistake. The actual winner was Moonlight. ^ a b c d e Gleiberman, Owen (August 31, 2016). "Film Review: 'La La Land'". Variety. Archived from the original on June 20, 2018. Retrieved October 29, 2017. ^ "La La Land (12A)". British Board of Film Classification. October 14, 2016. Archived from the original on June 20, 2018. Retrieved February 22, 2017. ^ Bart, Peter. "Peter Bart: 'La La Land' Adds Musical Backbeat To Wide-Open Awards Race". Deadline Hollywood. Archived from the original on June 20, 2018. Retrieved December 2, 2016. ^ a b "La La Land (2016)". Box Office Mojo. Archived from the original on June 20, 2018. Retrieved December 22, 2017. ^ "La La Land (2016)". Fandango. Archived from the original on June 22, 2018. Retrieved June 21, 2018. ^ a b c d Anderson, Ariston (August 31, 2016). "'La La Land': Emma Stone, Director Damien Chazelle Talk Bringing Back Hope in Films". The Hollywood Reporter. Archived from the original on June 22, 2018. Retrieved October 9, 2016. ^ a b Hipes, Patrick; Patten, Dominic (April 14, 2015). "Ryan Gosling & Emma Stone Circling Damien Chazelle's 'La La Land'". Deadline Hollywood. Archived from the original on June 22, 2018. Retrieved August 20, 2015. ^ a b c d e Smith, Nigel M (September 8, 2016). "Damien Chazelle on La La Land: 'Los Angeles is full of people chasing dreams'". The Guardian. Archived from the original on June 22, 2018. Retrieved October 9, 2016. ^ a b c d e f g h i j k l m n o Ford, Rebecca (November 3, 2016). "How 'La La Land' Went From First-Screening Stumbles to Hollywood Ending". The Hollywood Reporter. Archived from the original on June 22, 2018. Retrieved November 3, 2016. ^ Goldstein, Meredith. "'La La Land' could have been set in Boston". The Boston Globe. Archived from the original on June 22, 2018. Retrieved September 20, 2016. ^ a b c d e f Murphy, Mekado (November 4, 2016). "L.A. Transcendental: How 'La La Land' Chases the Sublime". The New York Times. Archived from the original on June 22, 2018. Retrieved November 5, 2016. ^ Hammond, Pete (August 30, 2016). "Damien Chazelle's 'La La Land', An Ode to Musicals, Romance & L.A., Ready to Launch Venice and Oscar Season". Deadline Hollywood. Archived from the original on June 22, 2018. Retrieved October 9, 2016. ^ Phillips, Michael (September 12, 2016). "Ryan Gosling sings, dances, reads in margins of Gene Kelly's annotated script". Chicago Tribune. Archived from the original on June 22, 2018. Retrieved October 10, 2016. ^ McGovern, Joe (February 2, 2017). "How America in Paris Won Best Picture and Changed Hollywood". Entertainment Weekly. Archived from the original on June 22, 2018. Retrieved September 24, 2017. ^ a b c d McGovern, Joe (August 30, 2016). "La La Land director on the 'timeless glamour' of Ryan Gosling & Emma Stone". Entertainment Weekly. Archived from the original on June 22, 2018. Retrieved October 10, 2016. ^ a b c d e f g h i j k l m Reegan, Rebecca (September 12, 2016). "With 'La La Land,' Emma Stone and director Damien Chazelle aim to show that original musicals aren't all tapped out". Los Angeles Times. Archived from the original on June 22, 2018. Retrieved October 10, 2016. ^ Hammond, Pete (September 3, 2016). "Tom Hanks Interrupts His Own 'Sully' Q&A To Lavishly Praise 'La La Land' – Telluride". Deadline Hollywood. Archived from the original on June 22, 2018. Retrieved October 9, 2016. ^ a b c d Alter, Ethan (September 16, 2016). "Emma Stone on Reteaming With Ryan Gosling in 'La La Land' and Her New Appreciation of Los Angeles". Yahoo! Movies. Archived from the original on June 22, 2018. Retrieved October 10, 2016. ^ Roxborough, Scott (September 25, 2016). "Zurich: Lionsgate's Patrick Wachsberger on His Journey from Jerry Lewis to 'Twilight,' 'La La Land'". The Hollywood Reporter. Archived from the original on June 22, 2018. Retrieved October 10, 2016. ^ Wiest, Brianna. "Emma WATSON Almost Starred in 'La La Land'". Teen Vogue. Archived from the original on June 22, 2018. Retrieved April 25, 2017. ^ a b c Jones, Emma (October 6, 2016). "La La Land: Gosling and Stone serenade Hollywood". BBC. Archived from the original on June 22, 2018. Retrieved October 10, 2016. ^ Grobar, Matthew (November 5, 2016). "Emma Stone Reveals Unorthodox 'La La Land' Audition; Mel Gibson on 'Hacksaw Ridge' Inspiration – The Contenders". Deadline Hollywood. Archived from the original on June 22, 2018. Retrieved November 6, 2016. ^ a b c d e f Gay, Jason (October 14, 2016). "Emma Stone Takes the Biggest Leap of Her Career With La La Land". Vogue. Archived from the original on June 22, 2018. Retrieved October 16, 2016. ^ "This painful audition scene in 'La La Land' was based on Ryan Gosling's real-life experience". Los Angeles Times. Archived from the original on June 22, 2018. Retrieved October 10, 2016. ^ Neha Prakash (February 9, 2017). "Emma Stone Talks About Meeting Ryan Gosling for the First Time 7 Years Ago". Glamour. Archived from the original on June 22, 2018. Retrieved June 22, 2018. ^ Hipes, Patrick (July 8, 2015). "Sonoya Mizuno, Jessica Rothe & Callie Hernandez Move into 'La La Land'". Deadline Hollywood. Archived from the original on June 22, 2018. Retrieved August 20, 2015. ^ Ford, Rebecca (July 10, 2015). "'La La Land' Adding 'American Horror Story' Actor Finn Wittrock (Exclusive)". The Hollywood Reporter. Archived from the original on June 22, 2018. Retrieved August 20, 2015. ^ Hipes, Patrick (August 4, 2015). "Rosemarie DeWitt Chimes in For 'La La Land'". Deadline Hollywood. Archived from the original on June 22, 2018. Retrieved August 20, 2015. ^ Kroll, Justin (August 4, 2015). "John Legend in Talks to Join Emma Stone and Ryan Gosling in Musical 'La La Land'". Variety. Archived from the original on June 22, 2018. Retrieved August 6, 2015. ^ A. Lincoln, Ross (August 11, 2015). "John Magaro Joins 'War Machine'; Jason Fuchs Moves to 'La La Land'". Deadline Hollywood. Archived from the original on June 22, 2018. Retrieved August 16, 2015. ^ Pederson, Erik (August 10, 2015). "Tony Sirico Joins Woody Allen's Latest; Meagen Fay Tunes Up for 'La La Land'". Deadline Hollywood. Archived from the original on June 22, 2018. Retrieved January 12, 2017. ^ Lázaro, Margarita (January 13, 2017). "27 curiosidades de 'La La Land'". El Huffington Post (español). Archived from the original on June 22, 2018. Retrieved March 24, 2017. ^ "Shot in CinemaScope, La La Land vibrantly romances the olden days of Hollywood". January 10, 2017. Archived from the original on January 31, 2017. ^ Gray, Richard (December 14, 2016). "Review: La La Land". Archived from the original on June 22, 2018. ^ Desowitz, Bill (November 10, 2016). "Oscars 2017: Why Cinematographers for Scorsese, Chazelle and More Shot on Film". IndieWire. Archived from the original on June 22, 2018. Retrieved December 3, 2017. ^ Dabrowska, Diana (September 5, 2016). "La La Land (Damien Chazelle, US) – Special Presentations". CinemaScope. Archived from the original on June 22, 2018. Retrieved December 3, 2017. ^ "On the Set for 8/14/15: Marlon Wayans Starts Fifty Shades of Black, Bill Condon Wraps Up Beauty and The Beast". SSN Insider. August 14, 2015. Archived from the original on August 21, 2017. Retrieved August 20, 2015. ^ "Ryan Gosling sees 'La La Land' as an opportunity to show off Los Angeles". Los Angeles Times. Archived from the original on June 22, 2018. Retrieved November 6, 2016. ^ a b D'Alessandro, Anthony (December 10, 2016). "How 'La La Land' Director Damien Chazelle, His Team & Lionsgate Faced The Music & Resurrected The Original Hollywood Musical". Deadline Hollywood. Archived from the original on June 22, 2018. Retrieved December 11, 2016. ^ D'Alessandro, Anthony (September 12, 2016). "How Damien Chazelle Pulled Off That L.A. Freeway Musical Number in 'La La Land' – Toronto Studio". Deadline Hollywood. Archived from the original on June 22, 2018. Retrieved October 9, 2016. ^ Sullivan, Kevin P. (February 24, 2017). "How Emma Stone and Ryan Gosling Helped Write Their 'La La Land' Fight". Entertainment Weekly. Archived from the original on June 22, 2018. Retrieved December 3, 2017. ^ a b "'La La Land' Soundtrack Details". Film Music Reporter. November 17, 2016. Archived from the original on June 22, 2018. Retrieved January 15, 2017. ^ Vivarelli, Nick (June 20, 2016). "Damien Chazelle's 'La La Land' to Open Venice Film Festival in Competition". Variety. Archived from the original on June 22, 2018. Retrieved June 20, 2016. ^ "La La Land". Venice Film Festival. Archived from the original on October 24, 2016. Retrieved August 30, 2016. ^ Hammond, Pete (September 1, 2016). "Telluride Film Festival Lineup: 'Sully', 'La La Land', 'Arrival', 'Bleed For This' & More". Deadline Hollywood. Archived from the original on June 22, 2018. Retrieved September 1, 2016. ^ Nolfi, Joey (July 27, 2016). "Toronto Film Festival 2016: Magnificent Seven, La La Land to screen". Entertainment Weekly. Archived from the original on June 22, 2018. Retrieved August 30, 2016. ^ "La La Land". BFI London Film Festival. Archived from the original on June 22, 2018. Retrieved September 10, 2016. ^ Hipes, Patrick (October 20, 2016). "'La La Land' Added As AFI Fest Centerpiece Gala". Deadline Hollywood. Archived from the original on June 22, 2018. Retrieved October 20, 2016. ^ Sneider, Jeff (April 30, 2015). "'Power Rangers,' Kristen Stewart's 'American Ultra' Land Release Dates". TheWrap. Archived from the original on June 22, 2018. Retrieved August 20, 2015. ^ Lang, Brent (March 7, 2016). "Ryan Gosling, Emma Stone Musical 'La La Land' Grabs Oscar Season Debut". Variety. Archived from the original on June 22, 2018. Retrieved March 13, 2016. ^ D'Alessandro, Anthony (September 23, 2016). "'La La Land' Shuffles Back One Weekend in December Rollout". Deadline Hollywood. Archived from the original on June 22, 2018. Retrieved September 23, 2016. ^ "La La Land Dances into Select IMAX® Theatres". IMAX. January 5, 2017. Archived from the original on June 22, 2018. Retrieved January 5, 2017. ^ "LA LA LAND (2016)". British Board of Film Classification. Archived from the original on June 22, 2018. ^ Tartaglione, Nancy (December 11, 2016). "'Fantastic Beasts' Conjures $680M WW; 'Christmas Party' & 'Sing' Swing; 'Hacksaw' Wows in China Bow – Intl Box Office". Deadline Hollywood. Archived from the original on June 22, 2018. Retrieved December 12, 2016. ^ Fleming Jr, Mike (March 21, 2017). "No. 18 'La La Land' Box Office Profits – 2016 Most Valuable Movie Blockbuster Tournament". Deadline Hollywood. Archived from the original on June 23, 2018. Retrieved March 22, 2017. ^ McClintock, Pamela (December 9, 2016). "Weekend Box Office: 'Office Christmas Party' Wins Friday; 'La La Land' Soars". The Hollywood Reporter. Archived from the original on June 23, 2018. Retrieved December 11, 2016. ^ Mendelson, Scott (December 10, 2016). "Box Office: 'Office Christmas Party' Topped Friday, But 'La La Land' Nabbed Festive $300K". Forbes. Archived from the original on June 23, 2018. Retrieved December 11, 2016. ^ Brooks, Brian (December 11, 2016). "'La La Land' Dances To Year's Best Box Office Theater Average". Deadline Hollywood. Archived from the original on June 23, 2018. Retrieved December 12, 2016. ^ "'Rogue One' Flying To $152M+ Weekend; 'Collateral Beauty' A Career B.O. Low For Will Smith: PM Update". Deadline Hollywood. Archived from the original on June 23, 2018. ^ "With 'Fences,' 'La La Land' Enter Top 10 As 'Rogue One' & 'Sing' Rule Holiday – Monday AM Update". Deadline Hollywood. Archived from the original on June 23, 2018. ^ "'Rogue One' Doesn't Want To Fall To 'Hidden Figures' As Winter Storm Helena Closes Theaters". Deadline Hollywood. Archived from the original on June 23, 2018. ^ a b "'Hidden Figures' Stays Smart, But Why Are So Many Movies Bombing Over MLK Weekend?". Deadline Hollywood. Archived from the original on June 23, 2018. ^ "Is Controversy Impacting 'A Dog's Purpose' At The Box Office?". Deadline Hollywood. Archived from the original on June 23, 2018. ^ "Universal/Blumhouse's 'Get Out' Now Grabbing A $30M+ Opening". Deadline Hollywood. Archived from the original on June 23, 2018. Retrieved February 27, 2017. ^ D'Alessandro, Anthony (March 6, 2017). "'Logan's $85.3M Debut Breaks Records For Wolverine Series & Rated R Fare; Beats 'Fifty Shades' & 'Passion Of The Christ'". Deadline Hollywood. Archived from the original on June 23, 2018. Retrieved March 5, 2017. ^ Ciras, Heather (August 31, 2016). "Emma Stone and Ryan Gosling's 'La La Land' gets rave reviews in Venice". Boston Globe. Archived from the original on June 23, 2018. Retrieved October 29, 2017. ^ Phillips, Michael (September 1, 2016). "Venice audiences enchanted by 'La La Land'". Chicago Tribune. Archived from the original on June 23, 2018. Retrieved October 29, 2017. ^ Hopewell, John (August 31, 2016). "Ryan Gosling, Emma Stone, Damien Chazelle's 'La La Land' Wow Venice". Variety. Archived from the original on June 23, 2018. Retrieved October 29, 2017. ^ Desta, Yohana (August 31, 2016). "La La Land Stuns at the Venice Film Festival". Vanity Fair. Archived from the original on June 23, 2018. Retrieved October 29, 2017. ^ "La La Land (2016)". Rotten Tomatoes. Fandango Media. Archived from the original on June 23, 2018. Retrieved December 13, 2018. ^ "La La Land Reviews". Metacritic. CBS Interactive. Archived from the original on June 23, 2018. Retrieved October 29, 2017. ^ "Top 100 Movies of 2016". Rotten Tomatoes. Fandango Media. Archived from the original on June 23, 2018. Retrieved February 13, 2017. ^ "The Best Movies of 2016". Metacritic. CBS Interactive. Archived from the original on June 23, 2018. Retrieved January 14, 2017. ^ D'Alessandro, Anthony (January 30, 2017). "Forget About Being Oscar Best Pic Rivals, 'La La Land' & 'Hidden Figures' Are In A B.O. Battle: Oscar Boost". Deadline Hollywood. Archived from the original on June 23, 2018. Retrieved December 3, 2017. ^ Travers, Peter (December 6, 2016). "'La La Land' Review: Magical Modern-Day Musical Will Sweep You Off Your Feet". Rolling Stone. Archived from the original on June 23, 2018. ^ Phillips, Michael (December 15, 2016). "'La La Land' review: Stone, Gosling light up Damien Chazelle's romantic reverie". Chicago Tribune. Archived from the original on June 23, 2018. ^ Scott, A. O. "Review: Ryan Gosling and Emma Stone Aswirl in Tra La La Land". The New York Times. Archived from the original on June 23, 2018. Retrieved December 8, 2016. ^ Bradshaw, Peter (August 31, 2016). "La La Land review: Ryan Gosling and Emma Stone shine in a sun-drenched musical masterpiece". The Guardian. Archived from the original on June 23, 2018. Retrieved October 10, 2016. ^ Charity, Tom (November 4, 2016). "First-look review: Damien Chazelle's La La Land (2016) | Sight & Sound". BFI. Archived from the original on June 23, 2018. Retrieved December 8, 2016. ^ Burr, Ty (December 14, 2016). "'La La Land' resurrects the classic movie musical". The Boston Globe. Archived from the original on June 23, 2018. Retrieved October 29, 2017. ^ Lawler, Kelly (January 11, 2017). "The Oscar race: The case against 'La La Land'". USA Today. Archived from the original on June 23, 2018. Retrieved January 14, 2017. ^ Lott-Lavigna, Ruby (January 10, 2017). "La La Land review: an ambitious musical soured by racist undertones". Wired. Archived from the original on June 23, 2018. Retrieved January 14, 2017. ^ Silman, Anna (December 13, 2016). "La La Land: A Musical Ode to Men Who Love Loving Jazz". New York. Archived from the original on June 23, 2018. Retrieved January 14, 2017. ^ Madison III, Ira (December 19, 2016). "La La Land's White Jazz Narrative". MTV News. Archived from the original on June 23, 2018. Retrieved January 14, 2017. ^ Reed, Rex (December 15, 2016). "Good-Intentioned But Overrated, 'La La Land' Reeks of Mothballs". New York Observer. Archived from the original on June 23, 2018. Retrieved February 25, 2017. ^ "Your guide to the La La Land backlash: eight things people hate". South China Morning Post. January 27, 2017. Archived from the original on June 23, 2018. ^ Ritman, Alex (January 9, 2017). "BAFTA Awards: 'La La Land' Leads Nominations". The Hollywood Reporter. Archived from the original on June 23, 2018. Retrieved January 10, 2017. ^ Mitchell, Robert (February 12, 2017). "'La La Land' Wins Top Prizes at BAFTA Awards in London". Variety. Archived from the original on June 23, 2018. Retrieved February 12, 2017. ^ "Golden Globes 2017: The Complete List of Nominations". The Hollywood Reporter. December 12, 2016. Archived from the original on June 23, 2018. Retrieved December 12, 2016. ^ Lee, Ashley (January 8, 2017). "Golden Globes: 'La La Land' Breaks Record for Most Wins by a Film". The Hollywood Reporter. Archived from the original on June 23, 2018. Retrieved January 12, 2017. ^ "The 89th Academy Awards (2017) Nominees and Winners". Academy of Motion Picture Arts and Sciences (AMPAS). Archived from the original on June 23, 2018. Retrieved February 26, 2017. ^ "Oscars Nominations 2017: The Complete List of Nominees". The Hollywood Reporter. January 24, 2017. Archived from the original on June 23, 2018. Retrieved January 24, 2017. ^ Donnelly, Jim (February 26, 2017). "Moonlight Wins Best Picture After 2017 Oscars Envelope Mishap". Academy of Motion Picture Arts and Sciences. Archived from the original on June 23, 2018. Retrieved February 27, 2017. ^ Rothman, Michael (February 26, 2017). "'Moonlight' wins best picture after 'La La Land' mistakenly announced". ABC News. Archived from the original on June 23, 2018. Retrieved February 27, 2017. This page was last edited on 1 April 2019, at 06:10 (UTC).